If you live in Mesa, Tempe, Gilbert, or any of the surrounding communities in the greater Phoenix, Arizona area, our team has the solution to your storage needs. We’re just a few minutes away from places like Maricopa County Superior Court, Enterprise Rent-A-Car, Mesquite Grill & Sports Bar, and the Arizona Department of Transportation - Mesa. We provide both conventional storage units and vehicle parking spaces to customers all around the metropolitan area. 25 Foot Covered Spaces and Up. 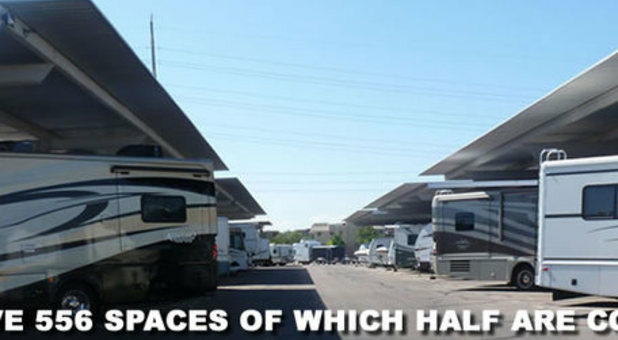 We’re one of the largest vehicle storage facilities in the United States, providing covered parking spaces from 20’ to 40’ feet long uncovered and covered.parking spaces! With a free dump station onsite, battery trickle charging available, and a fully paved property, our storage facility is a safe and convenient place to store your favorite vehicle. To add to all of this, we provide 24-hour access to all of our renters. You won’t find a better vehicle storage option in town. For your convenience, our office is open six days a week. You’re welcome to call or stop by between the hours of 9:30 a.m. and 4:30 p.m. Monday through Friday and between 10 a.m. and 2 p.m. Saturday. We’re operated by professional, onsite management, so we know how to properly address all of your questions and ensure a safe and pleasant self storage experience. Whether you’re ready to get started or you need some assistance in choosing your space, we’re more than happy to help. Contact us today! Think hard about renting here! First the positive: Leah, the on-site manager is fantastic. Without her the place would be a nightmare. Leah will do anything to help you, unfortunately her hands are tied by Argus, the management company in Tucson. Money has been spent on added security and maintenance of the facility. I've been here for almost twenty years and there have been a lot of positive improvements in the last few years. Now the negative: As a thirty-three year business owner I have never seen a less responsive management company. It's all about the money. Although improvements have been made renters are paying for them. Since Argus has taken over our rent has gone up 30%. When you call Argus for an explanation they ignore you. I've left dozens of messages and have been ignored. Everything is put back on Leah who has little authority to do anything regarding fees. Leah is a wonderful person and its unfortunate shes put in this position. I've been told that rates were increased to reflect comparisons from other storage lots in the area. What Argus doesn't tell you is they also manage some of the lots used for comparative pricing. Very convenient to raise prices using property you manage and control. If you have a choice stay away from Argus managed properties! If Leah ever leaves this property run, don't walk to find another place to store your vehicle. •	Dale, Thanks for taking the time to provide us with some feedback. We would like to apologize for any inconvenience that may have occurred. However, we only manage one location in Gilbert, AZ. Our management office is open Monday-Friday 8am-5pm, we are available anytime during those hours and would love to chat with you. We value our customers and want them to be satisfied with the services we provide. Please give us a call to discuss any ways we can improve (520) 320-9135. Thank You. Lea was such a kind and helpful soul in helping me get my car stored. Pricing was great, there were no hidden fees, and prepayment is always an option. You want a quote, just take the advertised price by however many months - clean and simple. They're not going to hound you for an entire month if a day slips by, they'll gladly work with you. If I ever need to store my car again, I'll be sure to come back.